Suggestions for prayers, solos, anthems, visuals, and much more. Also available with CEB texts. David L. Bone is Executive Director of The Fellowship of United Methodists in Music and Worship Arts. He lives in Nashville, Tennessee. 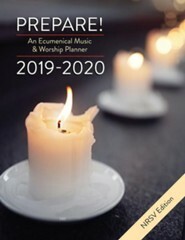 Mary Scifres is a United Methodist pastor, teacher, and consultant who inspires and equips twenty-first-century leaders in creative worship, church growth, visioning, and strategic planning. She is co-author of The United Methodist Music and Worship Planner and its ecumenical counterpart, Prepare!, and author of the worship evangelism book Searching for Seekers. A graduate of Boston University, she holds both the Master of Divinity and Master of Sacred Music degrees. Mary lives in Laguna Beach, California. I'm the author/artist and I want to review Prepare! 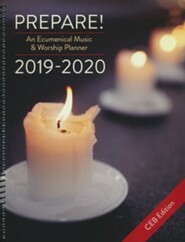 2019-2020: An Ecumenical Music & Worship Planner, NRSV edition.